A Haunt hides behind a veil of disguise, after spinning a web of hinderance. Her web will arrest and retard you, causing stagnation in life. She brings dark clouds and fogs the mind. She blurs your vision. She will obscure the way with ambiguity, and send you down a torturous, crooked path. 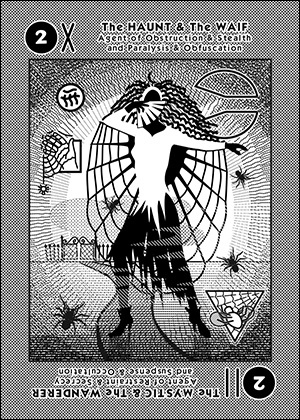 A Waif enveloped in a web is meandering down a tortured and crooked path. She is apprehensive. She can't see. First she is frustrated, then ambivalent. She has no motivation. She is lost. Soon she will disappear, and be missing altogether. This is a card for mysteries that are never solved.